If in need to set up an eCommerce website fast, there is no better option than Magento. 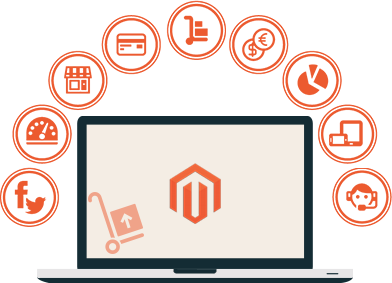 Magento is a flexible eCommerce software which is open source and available as a free download. This is a software that has been designed keeping the user in mind. Although it is easy to understand the working of the Magento Admin Panel, it will require some basic knowledge on the workings of an eCommerce website. When it comes to the Administrative Panel for Magento, almost everyone will feel that it is quite intuitive. It does help to have some knowledge of the workings of an eCommerce website and know what to expect. There are several features that one takes for granted, like the ability to be able to make new categories and add products in various categories. Besides which the shopping carts nowadays also allow editing many pages on the website via an inbuilt CMS, hence this is the other feature that most users and business owners do look for. There are several other features that one does expect like SEO tweaking, general website configuration, order management, etc. One of the main benefits of using Magento as your shopping cart is that it has a lot more to offer besides the basic features. This also means that there may be a bit of a learning curve when it comes to mastering the admin panel. Magento uses several keywords in the Admin panel and it is important to understand them. Store: A store is a term used to define the page where the visitors can make purchases. Magento allows you to create multiple stores, each with a design of its own. Store View: A store view is the “view” or layout of definition for a particular store. It is possible to have every store with a different layout and in a different language as well. Extensions: Magento has two types of extensions. One is the ‘Local Extenstion’ and the other is ‘Community Contributions’. If you need to make changes to the extensions the ‘Local Extensions’ folder is used. In addition to which it is also possible to download extensions some of which may come at a cost, others are free. These are stored in the ‘Community Contributions’ folder. Modules: In the case where you need to add custom functionality to your cart, you will need to modify the existing modules. Doing this requires advanced programming skills and a good understanding of how Magento works. Hence this is best left to the expert Magento developers. Blocks: Magento uses blocks to define the various sections on a page. Using blocks makes it easy to define the various sections of a page, where the blocks on each page are different. For example a page can have four blocks, one for the header, one the footer, one for the content and one for the sidebar. Themes: As one would expect, Magento does allow you to change the theme of the website. This has been divided into several sections and may require slightly advanced knowledge of Magento. Layouts: The layout is an XML file that contains the block design and contains the META tag and encodes of the page. Template: Template is the PHP file, that is used to render the design and tweak the visual design. This is usually defined as a PHTML file. Being an eCommerce Web Development company, we have highly skilled and certified developers to make sure our projects are completed in a timely manner. Our experience as a firm extends beyond Magento to include Web Development with multiple solutions and Digital marketing as well.